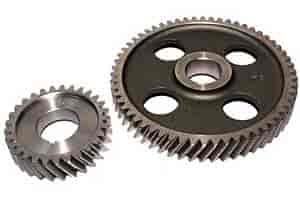 Comp Cams Gear Sets feature precision hobbed and crown-shaved aluminum, steel, or fiber gears as appropriate. The crank gear has three keyways for 4° of incremental adjustability and 4° maximum advance or retard. Comp Cams tests all gear sets for quality, consistency, strict tolerances, and timing accuracy. Does COMP Cams 3224 fit your vehicle? what is the dimensions of the gears?